The ASTM D8193 standard test method measures Total Oil and Grease (TOG) as well as Total Petroleum Hydrocarbons (TPH) in water and wastewater using liquid-liquid extraction with cyclohexane and a non-dispersive IR absorption measurement in the region of 1370 -1380 cm-1. Because of the deleterious aesthetic effect and impact on aquatic life, the public has an interest in the presence and concentration of oil and grease in domestic and industrial wastewaters. ASTM D8193 covers a range of 0.5 to 1000 mg/L with a precision of 0.5 mg/L in the low concentration range. 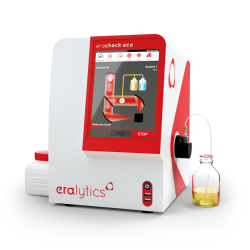 This range can be extended to lower or higher levels by adjusting the sample and solvent volumes in the liquid-liquid extraction step. In contrary to gravimetric methods, ASTM D8193 also considers the volatile fraction of hydrocarbons which evaporate and cannot be measured by gravimetric methods. Furthermore, a more complete fraction of extracted hydrocarbons are accessible by this method as compared to GC methods that do not detect fractions eluting outside the defined time window. ASTM D8193 offers an environmentally friendly and economical alternative to other IR based oil in water methods like ASTM D7066, ASTM D7678 or the discontinued ASTM D3921.